that girl in the wheelchair: fair time! As I waited for Jamie to meet me at the house so we could go meet up with our other friends and go onward and upward to Wilson County, it began to torrentially downpour. The wind was immediately knocked out of our cotton candy sails. Why God, why?!?! All I wanted in life was to spend my Saturday there. We opted not to throw in the towel right away, but instead just prolong the magic a bit. The new plan was to go to Donelson (about 35 minutes away) and eat Irish pub fair at McNamera's with everyone while waiting for the storm to blow over. [Tangent: It was a brilliant idea for us all to drink wine or whiskey or beer before going on carnival rides in the August heat. First prize goes to Josh for his Guiness and mussels combo, which assuredly would be a poor choice if they were to represent themselves after a spin in the Gravitron. Luckily the 6 of us went vomit free. We are pros.] While at our early dinner, all we could talk about was what we were gonna eat at the fair. Fried butter, fried candy bars, fried corn, fried oreos and the mysterious taco in a bag; so many culinary options. Sadly my eyes were bigger than my stomach, and the only food I ate was a funnel cake...but it was worth every bit of those million powdered sugared deep fried calories. Immediately when we got there at around 6:30, I was overwhelmed. Stimulation overload. People in jorts running amuck...the smell of fried and animal feces....people and lights and sounds coming at me in stereo. Being that it was my best friend's first trip to any fair, [Tangent: I know...I know...how is that possible? This is America.] she got first pick of rides. While she and a few others rode giant swings (that are just like the old Opryland ride called The Tennessee Waltz) Jamie and I tried to investigate where the monkey derby was going to be. We absolutely had our priorities straight. I love this picture. I want to have my vision altered so it sees things in Instagram. We got to the site of the Banana Derby, a little pen that smelled of monkey and were the geeks who were basically first in line for the show. Yes, we were more excited that the small children in front of us and had hyped it up so much that then our friends had wanted to witness this ridiculousness with us. Wow...look how creepy this picture is! 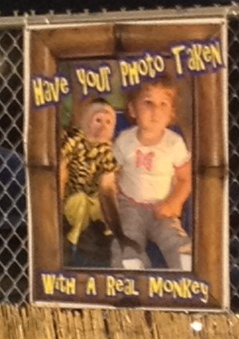 That child does not look too thrilled that a monkey is touching her thigh. my friend Jess looked way more enthusiastic. obligatory top of the ferris wheel pic: Kimmie edition. Because that slow paced creaky adventure cost us $8, we decided to go check out the petting zoo, which proved to be highly entertaining and free. This petting zoo was slightly terrifying. At first its all fun and games until a camel tries to eat your boyfriend's beard or you are swarmed by a gaggle of aggressively hungry goats. As soon as those little bastards see you pull out a carrot chip, you are overwhelmed with goat faces who look as if they have been on a week long coke bender. he thinks his beard is some vegetation, I guess. Jamie literally had to fight off this fella. His neck reached across the aisleway, so there was now way to escape his advances. The attendant who dispensed us the bag o' animal snacks instructed us to keep a flat hand when feeding the animals, but even though I tried to do so, I was still convinced that I was gonna somehow get bitten. As you can tell by these pictures, I was bit hesitant and only truly fed 3 goats (and they were ones that I felt weren't as needy and therefore wouldn't mistake my fingers with veggies). Sometimes I just ended up throwing the food at them or taking pictures of my boyfriend feed them. When did I become that girl? Anyway- my first trip to the infamous Wilson County Fair was a good one, and I realized that me and my friends are getting old because the next day most everyone texted me how tired and/or sore they were. We are obviously not teenagers anymore. Lebanon is my home town and I used to go to the fair every year. Pretty sure Cracker Barrel and the Wilson County Fair are the best things to come out of Lebanon. those are also two of my favorite things! this is the first year in a long time we haven't gone. i love that fair. though the monkeys riding dogs makes me really sad. they look so unhappy and scared. the pig race is much cuter. they have baby pot bellied pigs! oh i loved the tennessee waltz! what a classy name for that ride. it always seemed really glamorous to me. did you see the purity parade? i don't know what night they do that, but one year we were there and they threw ice cream sandwiches to the crowd! Next year we should go together...I feel like you and Travis would want to go to the weird animal attractions that me and jamie go to. We did catch a few minutes of the pig races when we were wandering looking for the monkey derby. They were pretty cute. I can't believe I missed an ice cream parade! I feel screwed over....ahh...there's always next year. did i mention that miss senior wilson county rides through the crowd in a limo? haha, amazing. I love your pics at the petting zoo.